Working from home is great, especially when starting each day would otherwise mean a two-hour train journey to Helsinki. On the downside I sometimes feel disconnected from my colleagues, since I only see them in person about once or twice a month. Of course we have video conferences when there’s a matter we need to discuss, but the spontaneous questions and chats of the workplace are lost. So a couple of weeks ago I had a revelation: why not just leave the connection on? Using an iPad at home (which I don’t usually need during the work day) and a spare laptop at the company HQ, we established our little virtual window. It’s not in anyone’s face, so it’s more informal than having an actual video meeting, but allows us to ask questions and share knowledge (and bad jokes) throughout the work day as if we were all in the same room. Some years ago browser testing meant just testing in Firefox, Safari and possibly Opera, and cursing and testing in IE6. Good standards support in current browsers has made development easier on one hand, but more complex than ever on the other hand with the demands of responsive design, the rise of mobile and websites themselves becoming more advanced. Now on the desktop we have to worry about Chrome, Firefox, Safari, Internet Explorer 7,8,9 & 10, and on ‘mobile’ there’s at least Safari for iOS (phone and tablet), Windows Phone, multiple versions of the Android Browser, Chrome for Android, the BlackBerry Browser, Firefox, Opera Mobile and Opera Mini. This post describes a snapshot of my current browser test setup and it’s the third part in my “web dev on Mac OS X” series. The first two were about utilities and web development apps. I’ll try to keep this series of posts up to date as the tools of the trade change. Since Firefox 3.6 was the last version not to be updated automatically, I like to keep it around, since it has quite a few issues with some HTML5 elements and CSS3. An easy way to install an old version of FF alongside the current version is via portableapps.com. Internet Explorer testing is annoying, because installing multiple stand-alone versions of IE is difficult, and in some cases impossible. I currently have a VMWare virtual machine running XP with IE versions 6,7 and 8, installed using Multiple IE. Unfortunately this setup is somewhat buggy, but it works. I have a separate Windows 7 and 8 VM’s running IE 9 and 10 respectively. This can get messy and requires a lot of HD space. Also, testing local websites requires editing the hosts file of each VM. Microsoft offers free VM images for IE7-10. Testing on real devices is essential, and at least before going live I try to test on as many devices as possible. Since my own collection is limited (Android, iOS and S60) and there’s no open device lab near me, I occasionally visit the local department store and try out all the phones on display. Necessary, but not very practical for quick debugging. For devices that support it (ie. Android and iOS), Adobe Edge Inspect is a great time saver. Basically it allows you to browse the same site synchronously on your desktop and your mobile via a mobile app and a browser extension. Even Edge Inspect doesn’t allow browsing local sites though, and that’s where the next solutions come in. The Opera Mobile Emulator is an excellent and easy way to test a responsive web site in a huge number of different sized displays. 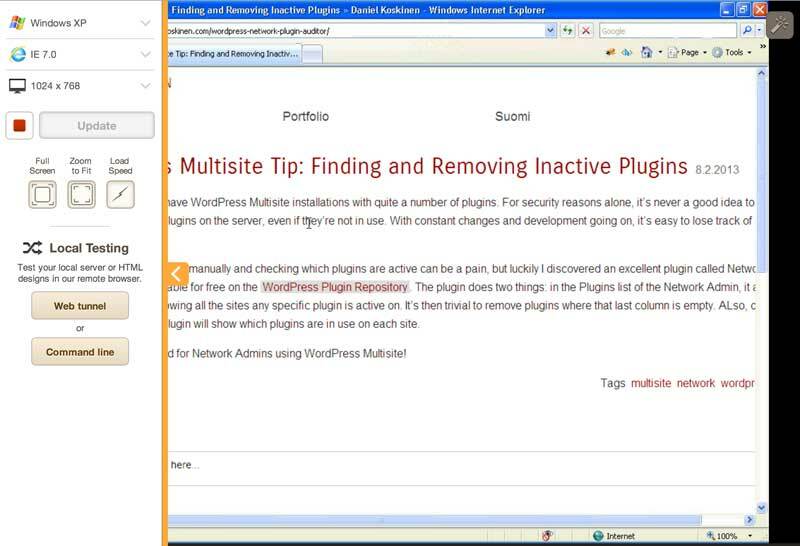 It’s a useful tool whether your users use Opera or not. The free Mac OS X Developer Tools include an iOS simulator, which is at least 99% identical to the actual devices (iPhones and iPads). The emulator allows rotating the device, simulated shakes etc. This is probably the mobile testing tool I use the most. Maintaining all these emulators is messy, to say the least. So I’ve been eyeing Browserstack, which allows testing in IE 6-10, recent versions of Chrome, Firefox, Opera, and best of all, emulators of most Android & iOS devices of significance. From my point of view the only thing missing is Windows Phone. Oh and Symbian would be nice too. The interface is really easy to use and straightforward. 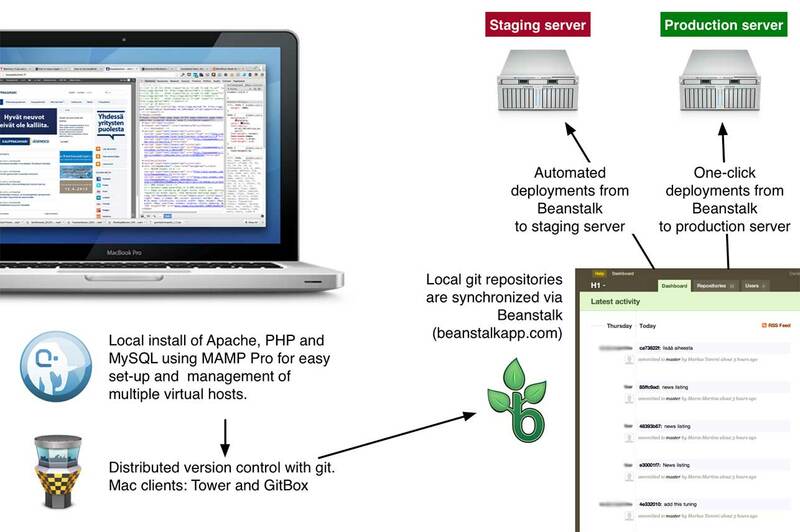 You input the address you want to test, choose an operating system and browser, and that’s it. Using a remote desktop via a browser is of course fairly slow, but the really killer feature of Browserstack is the ability to test local sites (like testsite.dev). This often makes Browserstack more convenient than the alternatives. Browserstack is a subscription service (starting at $19 per month for an individual user). If you feel like trying it out, there’s a Microsoft-sponsored three-month free trial available. 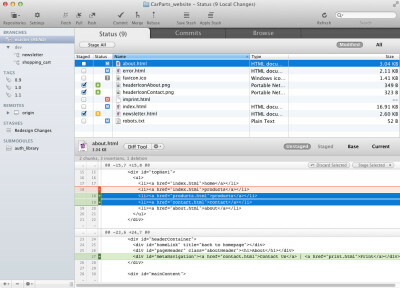 CrossBrowserTesting is another similar-looking service, although I haven’t tried it out. Browser testing is a complicated business, and your needs will depend on the type of site you’re developing and user demographic. Testing in more than one browser is a start, but mobile testing has also become a must. In a year or two it might even be more important than desktop browser testing, if it isn’t already. Testing on a real device gives a good feel to the restraints of that device, but remember your iPhone/Samsung/Nokia model isn’t the only one out there. As more and more varied devices enter the market and testing needs get more complex, tools like Browserstack are likely to be the only realistic testing option for the vast majority of designers and developers in the future. 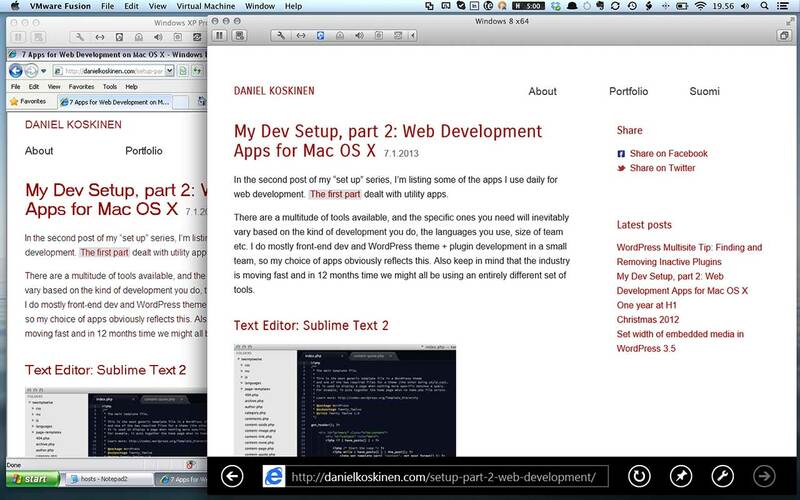 In the second post of my “set up” series, I’m listing some of the apps I use daily for web development. The first part dealt with utility apps. There are a multitude of tools available, and the specific ones you need will inevitably vary based on the kind of development you do, the languages you use, size of team etc. I do mostly front-end dev and WordPress theme + plugin development in a small team, so my choice of apps obviously reflects this. Also keep in mind that the industry is moving fast and in 12 months time we might all be using an entirely different set of tools. I’ve written about Sublime Text in an earlier post, but I’m still going to mention it. It’s one of the best code editors out there at the moment, if not the best. 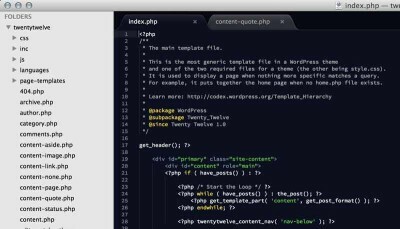 Highly extensible, there are plenty of good additions relating web development and WordPress. After having used Git for the last couple of years, it’s almost hard to imagine web development without some kind of version control. Learning at least the basics of git on the command line is most certainly recommended, but day-to-day I find a good GUI client is very handy. For many small projects the simple and elegant Gitbox (http://gitboxapp.com/, 13.99 € on the Mac App store) is quite enough, but for most projects I use Tower (http://www.git-tower.com/, 49.00 €). I’ll be expanding on how we use Git in WordPress projects in a later post. Sometimes (ie. often) you get conflicts when merging somebody else’s code with your own. 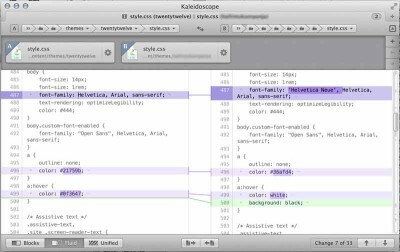 A good merge tool helps, and for the Mac you can use either the free FileMerge included in the Mac OS X Developer Tools, or the excellent Kaleidoscope. Kaleidoscope used to be just a really good (and pretty) file comparison tool, but in its latest version 2 beta it includes merging capabilities for text and folders. 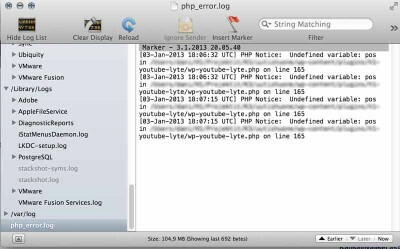 Thanks to my excellent colleague Marco, I’ve discovered how useful the built-in OS X Console.app can be for tracking down PHP errors when doing local WordPress development. This allows you to easily view any errors without printing them out using WP_DEBUG and messing up everything. 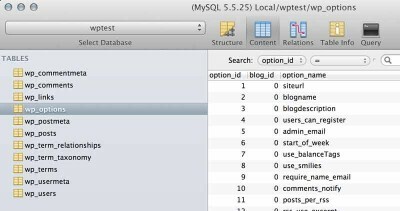 For both local and remote MySQL administration, there’s nothing better than Sequel Pro. And it’s free. 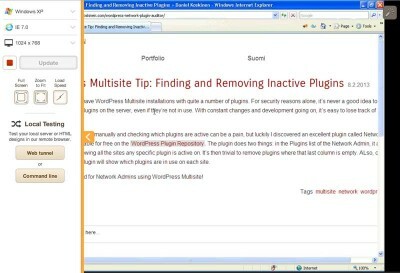 You can update plugins, set up multisite installs, create posts and much more. That’s all! 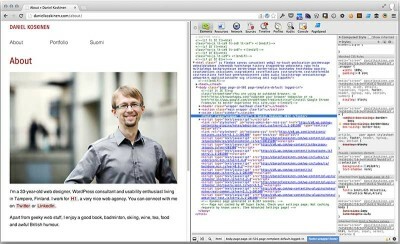 In the next post in this series, I’ll look into my browser testing setup. Yesterday marked one full year working for my current employer, H1. Professionally, this has been perhaps the most interesting and rewarding time I’ve ever had, despite working most of my time from home. So big thanks to my colleagues Aki, Jaana and Marco!